Born Kim Michaela Stark, 1968. My art and ceramics reflect the importance of flora and fauna and the environment in my life. I was born in Golden Bay and grew up in the small seaside settlement of Parapara. 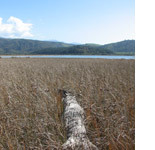 The estuary, sea and river evoke fond memories and the abundant wildlife it attracted. My father (John Stark) was a potter at the time and life often revolved around the pottery work shed, a place where I enjoyed making and creating with clay. After graduating from design school at the Christchurch Polytechnic in 1991 a career in graphic design, structural carton design and sign writing followed. West Melton, Canterbury is now my home. One of my recreational pleasures is scuba diving. I find the vast diversity of marine life captivating and it plays an important role in my art. 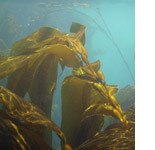 My underwater camera has become an invaluable tool on my underwater adventures. After attending pottery classes through the Canterbury Potters’ Association I set up a pottery studio at home in 2009. We converted the hay barn for my work space and the old horse stables have become a studio gallery. Apart from ceramics I also paint with acrylic, mixed media and encaustics (melted beeswax). Nature offers so much relevance and scope through my art. I enjoy conveying its beauty sometimes with a hint of beast. Man’s part to play in nature’s ecology has become of importance too. Currently water is the basis for my ceramic themes. 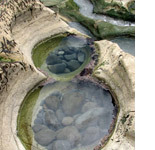 Rock pools, ponds and the sea have been an excellent basis to draw inspiration from. The shapes, textures and patterns add much stimulus to my art. I often include inscriptions on the interior of my ceramic vessels. These can be recollections from my childhood living in Golden Bay or commentary on the importance of waterways in our environment. Other sources of interest which add much to my ceramic art are insects, textiles, indigenous art and craft and furniture (vintage and modern). My ceramic forms are of clean and simple design. I maximise the ceramic’s surface with my decorative illustrations and textured imagery. My ceramics are made from clay rolled to the desired thickness, then decorated with coloured slips or pressed into textured reliefs. It is finally assembled into vessels or more abstract pieces. I use stoneware clay glaze electric fired to 1160°C. Kim Henderson was selected as one of US Ceramic Monthly Magazine’s Emerging Artists for 2012. She was one of fourteen artists chosen for this honour and her work was featured in the May 2012 issue. Ceramic Arts Daily selected Kim Henderson as a finalist for their International Emerging Ceramic Artist People’s Choice Award.